For Christmas, I gave Chris "A Year of Dates". That means that each month, I have planned out a date for the two of us to go on. Each month, he will open that month's envelope to find out what the date is. We did this back in 2014 and really enjoyed going on a date each month. Since then we have found it easy to push date nights to the side when we don't have them planned out. That's why I knew it was time to do "A Year of Dates" once again. This past weekend, we had our first date of 2017! I decided to plan a pretty low key "first date". With weather being unpredictable and the high probability of getting sick this time of year, I figured it was safer to plan an at home date for January. Chris and I used to go to movies a lot before Noah was born, averaging 3 a month! Since Noah was born, getting to the movie theater, especially for an adult movie, is pretty rare. So we have missed quite a few movies over the last few years. We've recently started watching a few shows (Gilmore Girls and Fuller House) on Netflix, so I thought it would be fun to stream a movie after Noah went to bed. I had a hard time remembering what movies we wanted to see, so I started browsing through lists of movies released in 2015 and 2016. I was very surprised to find out how few of the movies we were interested in are available for streaming. One of the movies on my list was The Intern, and Chris just happened to notice that it's been playing on HBO a lot recently. So we scrapped the Netflix plan and instead recorded it on our TiVo one random afternoon for us to watch this past weekend. I'm happy to report that our at home movie date went really well. I always worry that when we plan to do something after Noah goes to bed, that he will either be up later than we want or he will wake up multiple times, disrupting our evening. Thankfully, Noah fell asleep early and quickly and stayed asleep the entire evening, no problem! I brought down the monitor just so we wouldn't be paranoid over every little sound we heard. 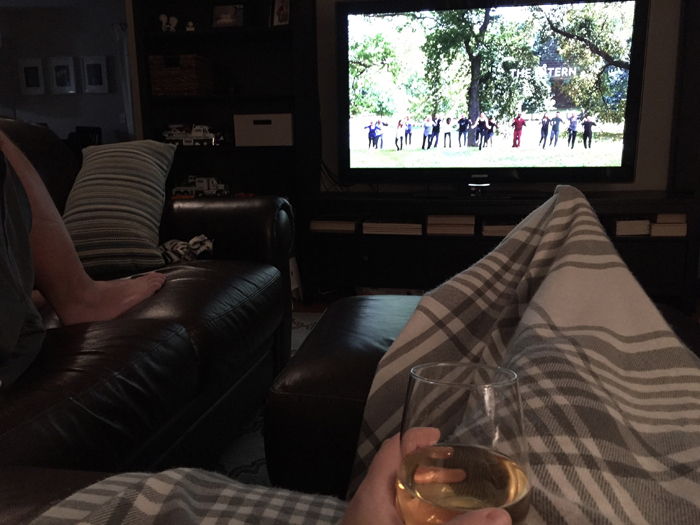 It allowed us to snuggle up on the couch and enjoy the movie with a glass of wine in hand. Last time we tried to watch a movie at home, we attempted to do it through Amazon Prime on our TiVo. Our internet was so slow that we maybe got 10 minutes into the third Hunger Games movie before it stalled and kept saying "buffering". Our movie plans were ruined that night and we ended up just watching random shows on our TiVo instead. Watching a recorded movie was definitely a better plan! And we both really enjoyed The Intern too! I am a big fan of both Anne Hathaway and Robert DeNiro and the two of them together was really cute. If you haven't seen it, I definitely recommend it. Have you seen any good movies lately?? 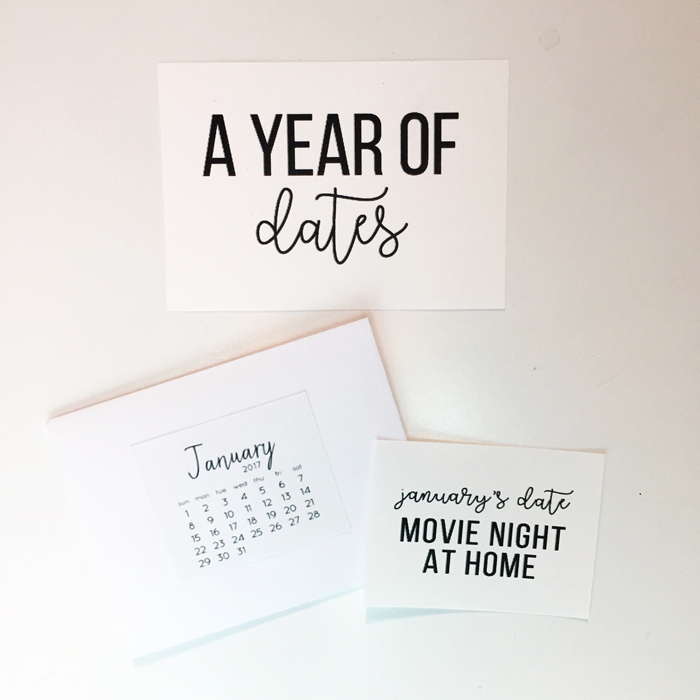 Love the date night envelopes for each month! So fun. Drew and I have decided to have a date night the last saturday of each month. Yippee!! So sweet that Chris wants to wait until Feb. 1st to open the next months. So I have always avoided the year of dates because I had always looked at it as being an expensive gift, but this just totally changed my mind. It could be whatever I wanted to make it. Duh! I don't know why I never thought of this before. What a great night relaxing together. So glad you guys had a successful date night at home! I've been wanting to see that movie. February sounds like a fun one, too! I always fall asleep during movies at home!! Glad it was a success for you! Sounds like fun! I always find it hard to find movies on Netflix when we feel like watching one! We have date night planned this weekend. Our goal is to have a date night one a month. I love the idea of gifting a year of dates but I'm not good about thinking way ahead. And I like allowing James to pick what we do too. What a fun idea! I think I'm gonna get Nate a year of dates for Valentine's day! What a sweet gift!! I haven't really watched many movies since 2013 when Olive was born. I should definitely look back at the best movies from the past few years and catch up at home.